It's color palette week at Zenadia Design! We'll be featuring one color palette a day this week so be sure to check back and see what we've come up with! To kick off Monday we've paired blue and white with a romantic end result. Blue and white are such versatile colors. They can be paired together to create a nautical look, a glamorous look, a classic look, and the list continues. Here, I have taken inspiration from a photo from Oia, Sanatori, Greece to create this color palette. (Photo is located in the top left corner.) 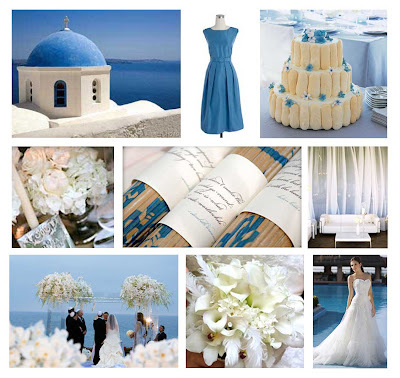 I envision a classic look for this blue and white color palette. Something casual and romantic, complete with candlelight and wispy sheer curtains to create rooms and a beautiful ambiance.